Helium is the second most abundant element, making up roughly a quarter of the (baryonic) matter in the universe. Hydrogen is, of course, the most abundant element. When stars form, they have a similar ratio of hydrogen to helium. But suppose you were to gather a Sun-massed quantity of helium. Would it collapse into a star? A while ago I wrote about a hypothetical situation where some advanced civilization might build a star out of hydrogen. We found that it was really just a matter of gathering enough mass. Once you reach about 90 Jupiter masses worth of hydrogen, it will become a small star. That’s the mass necessary for its interior to become hot enough and dense enough for hydrogen to start fusing. Adding more hydrogen would simply make it a larger, hotter, and brighter star. It’s tempting to think the same would be true for any type of matter. Gather enough stuff and you’ll eventually form a star. But that’s not necessarily true. The fusion of hydrogen into carbon. A star is typically defined as an object large enough for hydrogen to fuse in its core. Since our hypothetical helium star doesn’t have any hydrogen, let’s generalize this to be a point where nuclear fusion occurs. It turns out that hydrogen fuses fairly readily. Since its nucleus consists of a single proton, it’s the easiest material to fuse with itself (p-p chain), and it’s the easiest to fuse with other elements (CNO cycle). Helium is much more difficult to fuse. 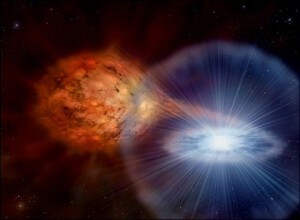 So difficult that the build up of helium in a star over time forms a fusion bottleneck that leads to a star’s demise. The only possible way to fuse pure helium is through a chain reaction known as the Salpeter process (after its discoverer Edwin Salpeter) or more commonly the triple-alpha process. 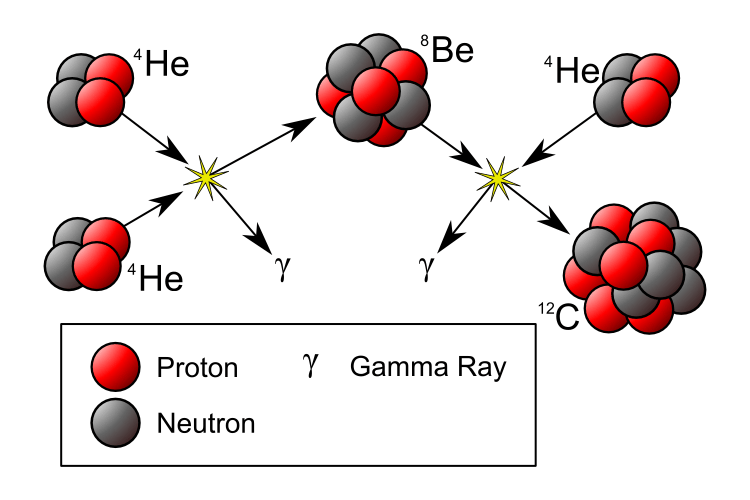 Two helium nuclei collide to form beryllium, which quickly collides with another helium to produce carbon-12, which is stable. Once carbon is formed, helium can fuse with it to create heavier elements. But all of these require much more effort than fusing hydrogen. Interior of a red giant star. Pure helium stars don’t exist in the universe, but we can get a good idea of what they might by like by looking at red giant stars. These are old stars that have used up most of their hydrogen. The core of a red giant consists mostly of “waste” helium produced over the course of its lifetime. 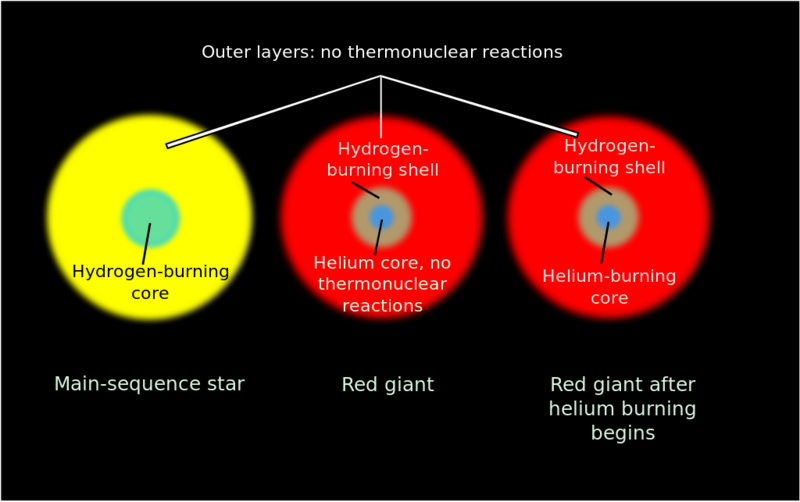 In a real red giant, there’s a layer of hydrogen outside the helium core that fuses heavier elements. The energy production of the hydrogen layer is so intense that the outer layers of the star expand and cool, hence the red giant star. Helium fusion can occur in stars with more than about 0.4 solar masses (420 Jupiter masses). Less than that and our ball of helium would never get hot enough to fuse. Technically it would be a large planet, but that’s a bit misleading. Large objects can create heat and light through gravitational collapse. The largest of helium “planets” would, for a time, shine as hot and bright as a small red dwarf star. Over time, our helium planet would continue to collapse as it loses heat. It would end its life either as a cold ball of helium (an old planet) or it would collapse into a white dwarf (like some old stars). The mass cut-off between the two is hard to determine. The smallest white dwarfs we’ve observed has about 17% the mass of our Sun, or about 175 Jupiter masses. So we can safely assume that anything larger than that will become a white dwarf. Helium fusion into carbon produces plenty of energy, but it also uses up helium fairly quickly. In a red giant, the triple-alpha process only lasts for a few hundred thousand years at best. Compared to small red dwarfs that can shine for trillions of years, a small helium star would only last for a few moments of cosmic time. Stars with less than about 3 solar masses aren’t large enough to fuse carbon into higher elements. 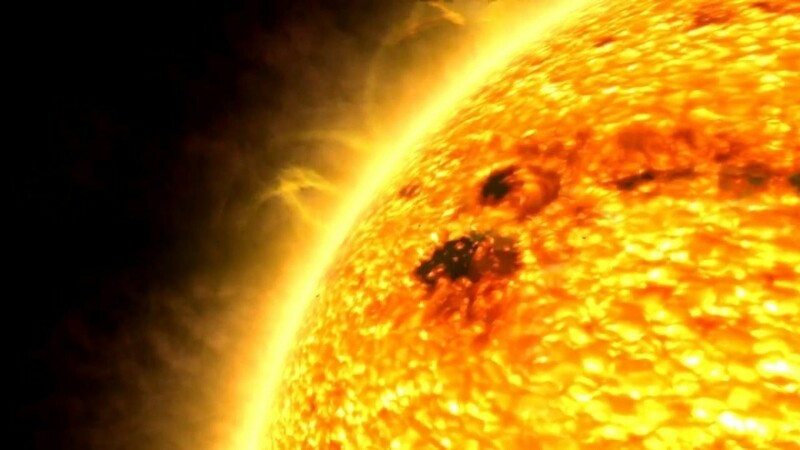 A helium star between 0.4 and 3 solar masses can fuse helium into carbon, but nothing more. How our helium star ends its life depends upon its mass. On the smaller end of the range, a helium star would eventually cool and collapse into a white dwarf. But white dwarfs have an upper mass limit of 1.4 solar masses. More than that and the white dwarf will collapse into a neutron star. Theoretical estimates on neutron star’s upper limit put it at about 3 solar masses, but the largest observed neutron stars are about 2 solar masses. If the limit really is closer to 2, then it’s possible that stars on the larger end of this range would end their lives as black holes. With more than 3 solar masses it’s possible to fuse carbon and helium into heavier elements, but by then you’ve reached a point of diminishing return. A star’s mass worth of carbon will be used up in a few hundred years, and the fusion of heavier elements would last for even shorter times. Like a normal star, a large helium star would likely expand into a red giant for a time, before collapsing to form a supernova, after which its core would collapse into a neutron star or black hole. So it is possible to create a helium star but such stars would be short lived, and wouldn’t produce the same range of elements that real stars produce. Hydrogen is central to so many nuclear reactions in stars that without it the universe would be a much darker place. interesting idea…. I would assume that the light emitted would be more IR range. I’m probably incorrect in that assumption but its based on atomic diameters and wavelengths. under such a situation there really is no way I’m aware of to tell if a star were helium or simply farther away and very large. in fact under the assumption that most stars are not hydrogen I would wager distances would look much closer and sizes would be smaller. we may improperly base too much of our data on redshift. should clarify that such a scenario is nearly 0% chance but its still worthy of note assuming I am in any way correct.